Fall Maple leaves (Acer Macrophyllum) on the slopes of Sasquatch Peak in Sasquatch Provincial Park, British Columbia, Canada. This year was not a great one for fall leaf colors in the Fraser Valley, probably in part due to the 4 month drought we had this summer. I am used to not having area-wide color and having to hunt a little for it though. Much like wildflowers, sometimes you only need one good spot to make a good photograph. One of the areas I checked for fall foliage this year was Deer Lake in Sasquatch Provincial Park. Just a short drive up the side of Harrison Lake near Harrison Hot Springs, Sasquatch Provincial Park is a nice recreation spot with 3 lakes, campgrounds, and hiking trails. 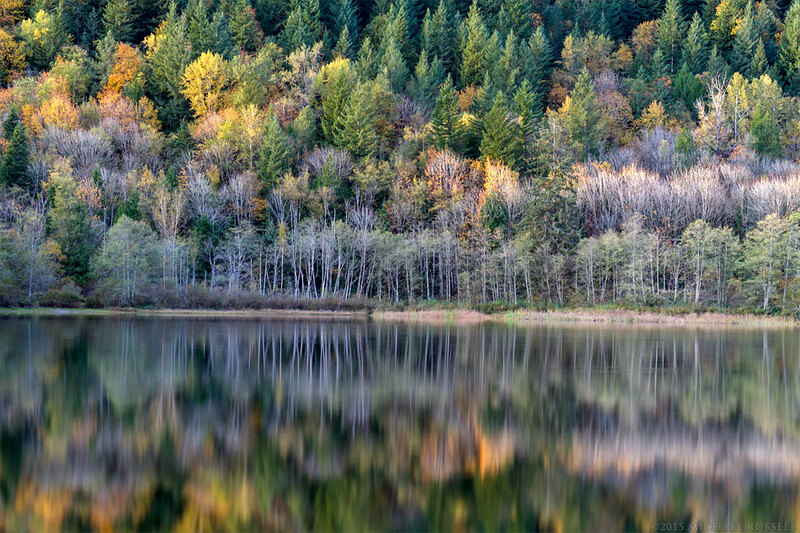 In the spring of 2013 I photographed a nice reflection at Deer Lake and noted it might be a good place to come back for fall foliage. The first photograph here is the result – though it did come with some problems. I had set up to somewhat recreate the photo linked above but a man showed up and was about to wade out into my reflection area to fish. I pointed out I would like to make two quick photos and I’d be finished. He doesn’t say anything but proceeds to wade into the water right in front of me and began fly fishing. After briefly wondering how my tripod would work as a cudgel I decided to simply photograph over his head and forgo the reflection shot for this year. 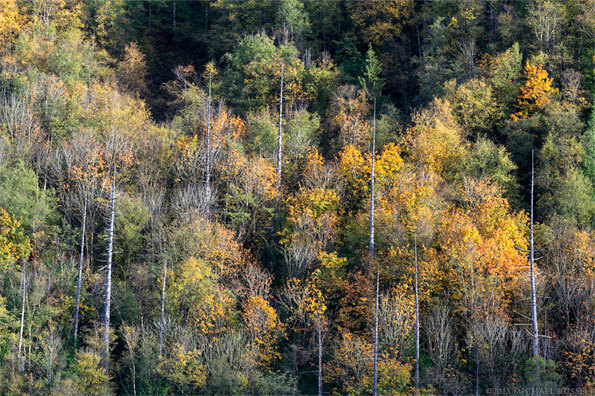 I like the results – the top photograph here and its alternates in my library have a nice mix of green conifers, fall maple leaf colors, and various snags and other light colored tree trunks. About 10 minutes after making these photos I heard him yelling and swearing. I looked around the corner and I guess his casting had gone awry and he had hooked himself in the back. I still do not feel bad about this. 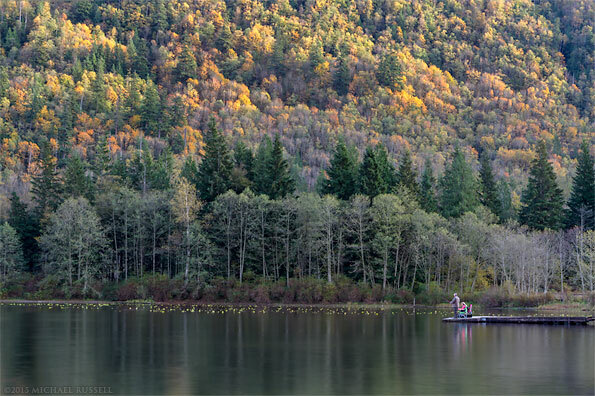 I briefly chatted with the older man and woman in the above photo as they were fishing for Rainbow Trout (Oncorhynchus mykiss) off the end of the dock at Deer Lake. As with many other lakes in BC, Deer Lake is stocked with fish by the Freshwater Fisheries Society of BC. For some of the reflection photographs I made at Deer Lake I had to wait until the ripples from rising fish dissipated – so it would appear this lake has a decent fish population. The fall foliage in the background of this photo is growing on the slopes of Sasquatch Peak, which is taller than the nearby Mount Hicks. The trails at Deer Lake don’t allow one to walk around the entire lake. These kayaks look like a great way to explore the shoreline. I included the above photograph in my 2016 Nature Calendar and the Top 10 Photographs of 2015 blog post. I think this might have been the best fall foliage scene I found this year, and the lack of wind (or fish ripples) at the time made for a very nice reflection. I may try to visit Sasquatch Provincial Park in the winter and see what scenes I can find when the trees have no leaves at all. This is the Deer Lake Trail between the parking lot and “The Point” – just below the Bench Campground. 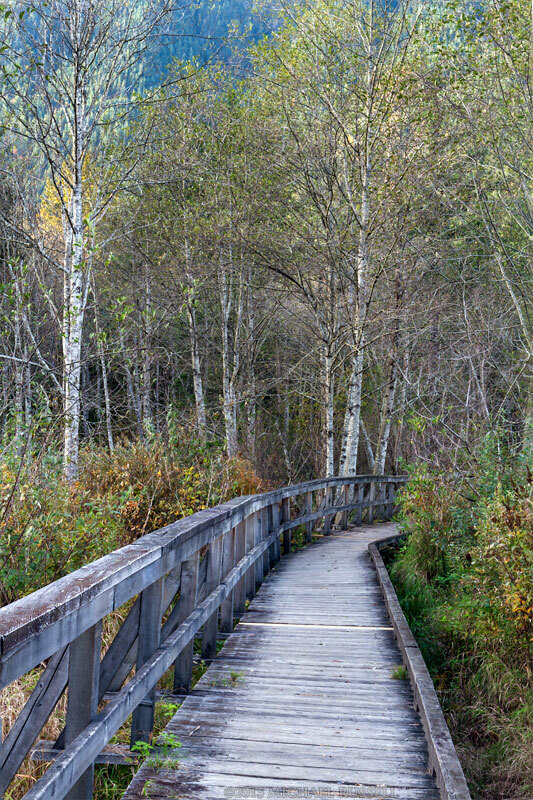 I liked the colours around the boardwalk here, and the light colored trunks of the Red Alder (Alnus rubra). 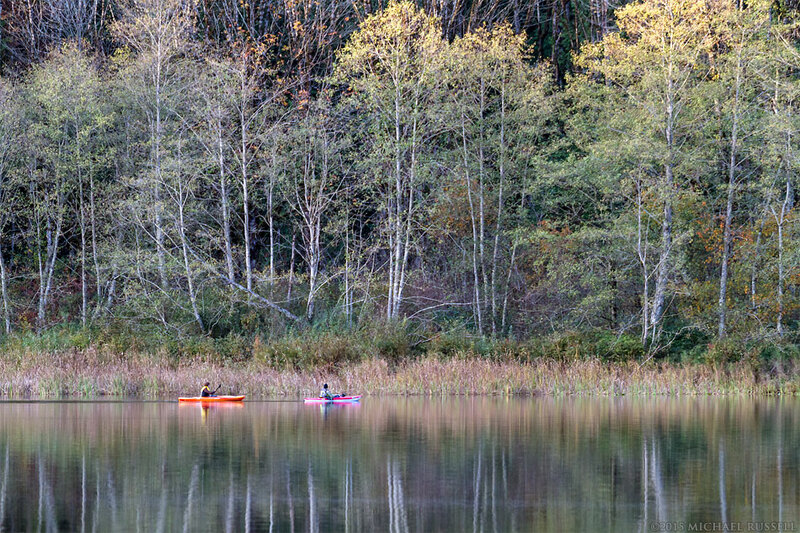 For more photographs from Deer Lake visit my Sasquatch Provincial Park Gallery.